CHELMSFORD, England, Jan. 31, 2019 /PRNewswire/ -- The team at Absolute Digital are thrilled to reveal their new branding, featuring a bright new blue and magenta colour theme and refreshing website design, showcasing the company's ethos of fresh thinking within the industry. The company says its rebrand is a visual representation of the growth that it has experienced since being founded in 2008 and the steps that it's taking to expand even further. The fresh new colour theme and overall design is the perfect showcase of all that it provides at Absolute Digital Media as well as the wide range of clients that it has worked alongside throughout the years. The rebrand will represent the fresh and innovative ideas that its team are producing and is the perfect opportunity to put Absolute Digital Media ahead of the curve in its industry. With outstanding results already achieved with a wide range of clients, the digital agency is excited to showcase this in its online space. "The team have worked tirelessly to produce a brand identity that we think truly reflects our company ethos and abilities. This rebrand comes at an exciting time for Absolute Digital, following our wins at the UK Search Awards and the Southern Business Awards at the end of 2018." 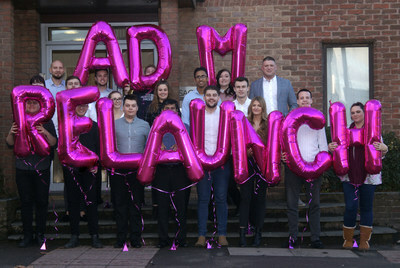 He continued, "This rebrand has set us up for an exciting new year, and we're eager to see what 2019 will bring for not only Absolute Digital but also for our clients." If you would like to know more about the services that Absolute Digital Media provide, get in touch with their team either online or call +44(0)800-088-6000.